June | 2013 | Go Chapel Hill! Come out for this fun weekend event in Carrboro! 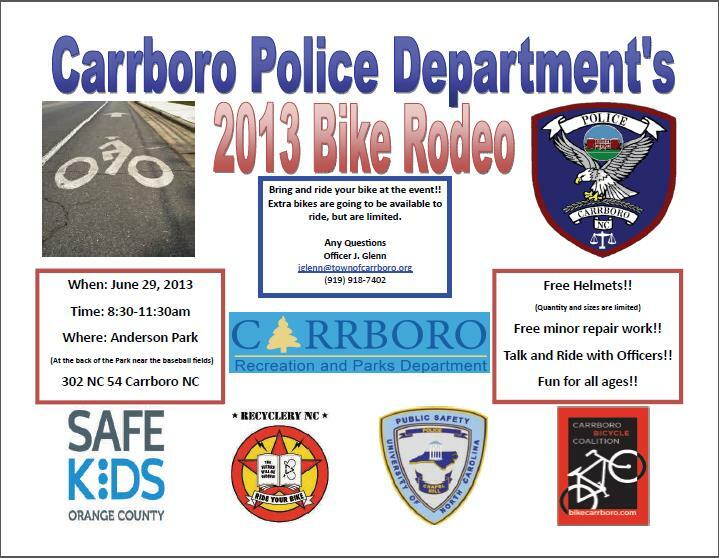 Check out Carrboro Bicycle Coalition’s website for more information. Help Plan Rosemary Street: Information, Conversation, Imagination! This is the first in a series of community meetings about Rosemary Imagined; an innovative community-led planning initiative that will refine our thinking of how Rosemary Street fits into the development and growth of downtown Chapel Hill. Come for information, conversation, and imagination about Rosemary Street and share your thoughts! Light refreshments will be provided. This community event is part of a 10-month process of engagement with the Town of Chapel Hill and the community to bring together several recent efforts by the community into a complete vision for the future of the Rosemary Street corridor. The Rosemary Street corridor was identified during the Chapel Hill 2020 process as one of the five Big Ideas; the “Big Ideas” are initiatives that embody the essence of the Chapel Hill 2020 goals and will serve as a beacon to guide the efforts of the Town and the community as Chapel Hill’s future is created. In addition, the 2010 draft Downtown Framework and Action Plan developed strong new ideas about connectedness of streets and neighborhoods and has been followed by the adoption of the Northside and Pine Knolls Community Plan. For more information, visit www.rosemaryimagined.com. Contact Dwight Bassett at 919-969-5015 and Meg McGurk at 919-967-9440 or email them at info@rosemaryimagined.com. We know what happens when gas prices are high. Many people park their cars and take public transportation instead. In fact, using public transportation is an economical way to beat high gas prices…if it is available. According to APTA’s most recent Transit Saving Report, a two-person household can save, on the average, more than $9,700 a year by downsizing to one car. At a time when our economy is still hurting and gas prices are continuing to rise, people need to save money. This is a time to increase public transportation service, not decrease it. However, Congress has yet to pass a long overdue surface transportation bill that will increase public transportation investment. State and local revenues that fund public transportation have declined since the economic recession started and that has also negatively impacted public transit systems’ budgets. All levels of government – federal, state, and local – should invest more in public transportation. From urban to suburban to rural communities, public transportation is a vital resource to Americans, and a cornerstone of our nation’s economy. Relying on public transit for their daily mobility needs, Americans use local public transportation systems to commute to and from work, to travel to school and the doctor’s office, to go shopping, and to visit with family and friends. Public transportation use reduces our nation’s dependence on foreign oil by 4.2 billion gallons of gasoline a year and it also saves 37 million metric tons of carbon emissions annually. Last, but not least, public transportation has a proven track record of reducing congestion. The latest research shows that in 2011, U.S. public transportation use saved 796 million hours in travel time, 450 million gallons of fuel, and $21 billion in congestion costs in 498 urban areas. In 2012, Americans took 10.5 billion trips on public transportation. 35 million times each weekday, people board public transportation. More than 7,300 organizations provide public transportation in the United States. Without public transportation, congestion costs in 2011 would have risen by nearly $21 billion from $121 billion to $142 billion. Access to public transportation gives people transportation options to commute to work, go to school, visit friends, or travel to a doctor’s office.